Jointly organized by the European Observatory on Memories (EUROM) and Fundació Cipriano García. 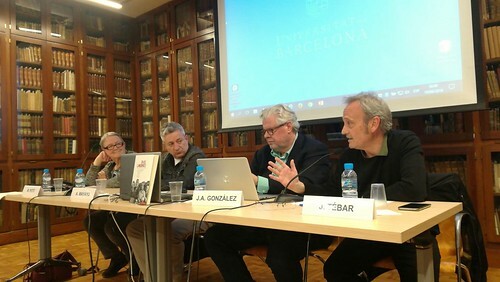 The debate will count with the participation of Mariona Petit, delegate of the Democratic Student’s Trade Union of the University of Barcelona in 1967/1968, and with the movie producer Joan Antoni González, who will also introduce the screening of “Spagna ’68”. The short documentary movie by Helena Lumbreras was filmed in Madrid and Barcelona in complete secrecy. It is a reflection on the political and economic situation of the country in 1968, opposing Spain of “developmentalism” with that of misery. The director gives the floor to the students, the textile, metal and construction workers, who talk about their struggles, their difficulties, and their dreams. The film screening is a courtesy of the Archivio Audiovisivo del Movimento Operaio e Democratico.